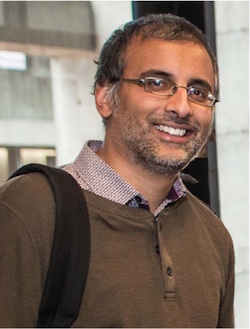 Akshay Venkatesh has been awarded the Fields medal, at the 2018 International Congress of Mathematicians in Rio, for his "synthesis of analytic number theory, homogenous dynamics, topology, and representation theory". Venkatesh says he has always been fascinated by numbers, from discovering binary numbers as a child, to his groundbreaking work in number theory as a mathematician: "Just manipulating numbers makes me happy". The field of number theory also appealed to him as a very young mathematician as you don't need much background in order to appreciate the beautiful results and open questions in the area. Most of Venkatesh's career has involved exploring the borders of number theory with different areas of mathematics. He has brought together concepts and tools from different areas with great impact on solving open problems and pointing the way to future progress. This ability is illustrated by his resolution of the sub convexity problem in number theory. The sub convexity problem essentially concerns the size of a particular type of function called an L-function. L-functions are generalisations of the Riemann-zeta function, the subject of an infamous open problem in mathematics called the Riemann hypothesis. (You can read more about L-functions and the Riemann hypothesis here. ) In the 19th century the mathematician Bernhard Riemann showed that the locations at which the Riemann-zeta function takes the value of zero are inextricably linked with the distribution of the prime numbers (numbers divisible only by 1 and themselves) along the number line. This revolutionised our understanding of prime numbers in the 19th century and now L-functions are pivotal objects in number theory today. L-functions are functions of complex numbers – those numbers , where and are real numbers, and is the square root of -1 ( ). The Riemann hypothesis, as yet unproved, conjectures that all the places where the Riemann-zeta function is zero lie along something called the critical line, where the real part of these complex numbers is equal to a half (ie, where ). The subconvexity problem is concerned with tightening the upper bound on the size of L-functions along a critical line. This problem had been of some interest since Herman Weyl’s work a century ago, but has been the focus of more intense work in the last 10 to 15 years due to its applications, including links between number theory and chaos in quantum systems. Venkatesh, in part jointly with Philippe Michel, resolved the sub convexity problem in 2010. The result generalised all previous work on bounds for the problem and also brought together approaches from algebraic geometry, dynamics and number theory, proving significant new results in these areas along to way to a final proof. Venkatesh says that he understands L-functions using hyperbolic geometry – a special kind of geometry. You can tile a hyperbolic space with triangles but, as you can see in the image on the left, hyperbolic triangles are a little different: their angles add to less than 180 degrees. These hyperbolic tilings provide a surprising connection between seemingly different areas of mathematics. For example, Venkatesh uses automorphic forms to study these hyperbolic tilings. The sound wave created from playing the flat skin stretched over a drum can be described using periodic functions (sine waves). In a similar way automorphic forms, generalised versions of periodic functions, tell you the tone a drum would make if it was built using a "hyperbolic skin". Automorphic forms are part of an area of mathematics called harmonic analysis. 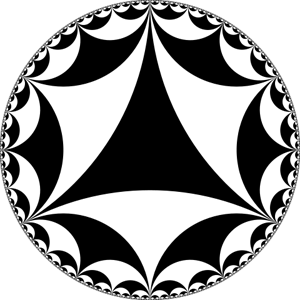 They are linked to the area of dynamics (the study of how things move over time) by hyperbolic tilings. The dynamical connection comes from playing a idealised version of billiards. Rather than playing the game of billiards on a rectangular table, you can imagine playing on a table shaped like a hyperbolic tile. The path of the ball bouncing off these curved sides is very complex. The study of such paths, trying to understand if the ball avoids some areas, or is attracted to others, links geometric and dynamical questions with number theory. And recently Venkatesh has been working in an area called cohomology of arithmetic groups, which is concerned with the shape or topology of the space made using hyperbolic tilings. These are really higher-dimensional objects with complex shapes involving holes. And despite first appearances, there is a strong connection between number theory and these higher-dimensional shapes: "Lots of information of number theory is encoded in these shapes." Venkatesh has been incredibly successful in making surprising and rich connections between different areas of mathematics, but he doesn't hide the fact that it has taken a lot of hard work: "A lot of the time when you do math, you're stuck. But at the same time there are these moments where you feel privileged that you get to work with it. And you have this sensation of transcendence. You feel like you've been part of something really meaningful."